Baja Designs introduced the latest version of their DSK in March 2011. 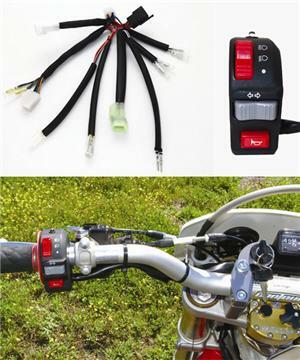 The kit incorporates a key switch for added protection when leaving you bike unattended. To utilize the latest switch you must upgrade your front harness. A benefit of this new front harness is the inclusion of a power plug for Acewell 1550 and 3200 units for customer wishing to add a speedometer/odometer unit. This is a complete package to upgrade your Classic DSK switch to the latest version for customers who desire the new slim switch or are replacing a damaged unit. Classic kits are identified by a battery and/or regulator mounted under the seat.